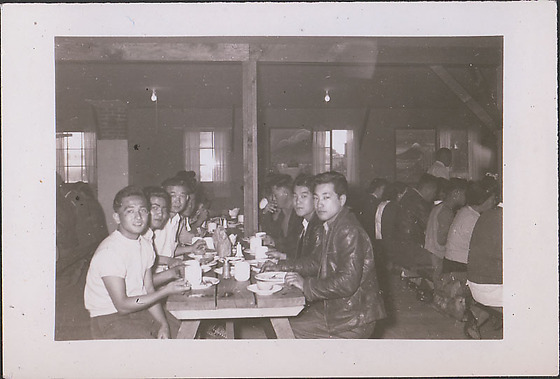 Six men seated at a table looking at viewer in Heart Mountain concentration camp mess hall, Wyoming, early 1943. Warren Isa, left front, wears a white t-shirt and dark pants. Across from him sits a young man in a leather jacket. Other men are seated at table in background. Backs of other diners seated at tables are visible on the left and right. There is a wooden beam in the center of the photograph. The table top wooden, unfinished and covered with dishes. Window with curtains in background.